One of the best ways to spend a warm summer day is on (and in) water. Guests of our Lenox MA Bed and Breakfast are always welcome to spend as much time as they like in our pool, and for some, a pool is all the water they need. Others crave something else. One of the more thrilling sections of the Housatonic River. 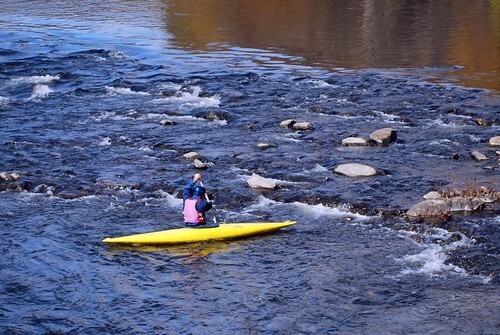 Paddle the Housatonic River. Bring your own kayak or rent one at the Arcadian Shop in Lenox. The shop will deliver kayaks to the public boat launch at Decker’s Landing on the Housatonic River, and pick them up at Woods Pond. Canoe the Housatonic River. Guided trips lasting approximately 2 hours are lead by Berkshires Canoe Tours, departing from Decker’s Landing in Lenox. Float on Onota Lake in nearby Pittsfield. Onota Boat Livery rents kayaks, canoes, fishing boats and small motorized boats. Fish, float, or navigate the shores. Explore Cheshire Lake. Berkshire Outfitters in Adams rents kayaks and canoes and will transport folks to Cheshire Lakes and a few other areas. Many guests of our Berkshires Bed and Breakfast travel with their own kayaks and canoes. In addition to the Housatonic River, they explore Stockbridge Bowl and the many lakes, ponds, and reservoirs of October Mountain State Forest. Our guests always have plenty of energy to fuel their activities thanks to the delicious, abundant breakfasts served each morning at the inn.